Bottom Line: A very tasty stout that will make for a great nightcap. Sweet stouts are brown to black in color and range from 4-6% in alcohol. They have a distinctive malt sweetness and often show chocolate and caramel flavors. Milk and cream stouts are the more common examples of this style. These beers obtain their character from chocolate malts and lactic (milk) sugars used in the brewing process. Sweet stouts originated as a British specialty but are now available all around the world. Noteworthy examples of this style include: St. Peter’s Cream Stout, Left Hand Milk Stout and Samuel Adams Cream Stout. 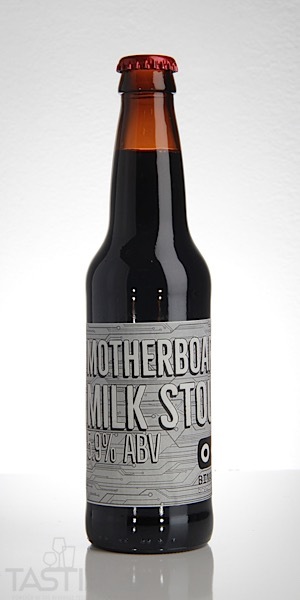 Binary Brewing Co. Motherboard Milk Stout rating was calculated by tastings.com to be 90 points out of 100 on 11/9/2018. Please note that MSRP may have changed since the date of our review.